reformed monk – Death… then life! 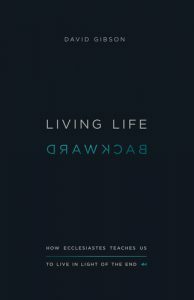 Book review: Living Life Backward: How Ecclesiastes Teaches Us to Live in Light of the End, by David Gibson. Who would think that a book extolling the contemplation of death would be such a delightful read? The main argument of the Book of Ecclesiastes is that only in preparing to die will we learn how to live. Hence, the title, Living Life Backward. Acknowledging and facing the unavoidable reality of death is the essential first step toward fruitful, joyful living. David Gibson guides his reader through the book as the writer of Ecclesiastes, the Preacher, makes his case. Gibson has a delightful way of expressing ideas, and the book is lucid, articulate, and engaging throughout. Having read the book, Ecclesiastes is no longer an enigma, and Gibson has helped me place it solidly in the overarching Christocentric theme of the rest of the Bible. At the beginning of each chapter, the relevant text from Ecclesiastes is provided. I found this to be very helpful, as I could refer to the text without having to refer to two books at once. Living Life Backward is written at a popular level, yet it will prove invaluable for teachers and preachers to use and deeply benefit from.